Update #2 : For those who have missed this, Flying Petals still has some photo books in stock. The payment period ends on May 2nd the books will be shipped in early May. Price and shipping fees haven’t changed. To place an order, please proceed as below. Presenting Flying Petals’ 1st Photobook project! If you would like to purchase more than 12 sets, please send an email to petals8939@naver.com. Therefore, you will not be able to order the book after the 9th February 2012. The Photobook will be shipped out sometime in late March. – Payment is to be made via Paypal (petals0309@naver.com). Note: The Paypal address is different to their email address. – Check “Personal” for payment options and then “Others”. Remember to pay the fee. *If you would like to send payment to flying petal’s Korean bank account directly send an email. Email a completed version of the form below AFTER sending payment to petals8939@naver.com. 2. Send payment via Paypal/bank transfer to petals0309@naver.com. Remember to pay any fees. 3. Send an email to petals8939@naver.com with a completed order form. OMG! you guys are killing me! But I must get this!! email me if any problems or questions!! thanks for the headsup on the bulk ordering….shipping to US is killing. but she didn’t reply me..
what should i do?is she still in hong kong? Don’t worry about it. 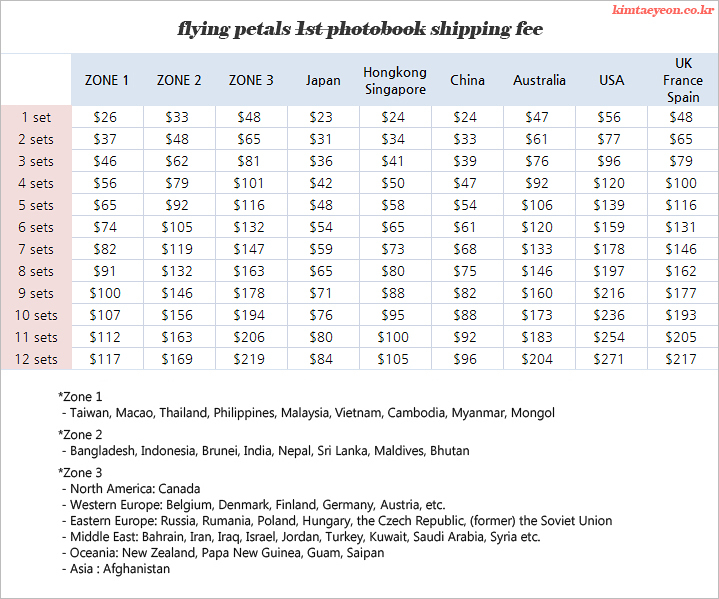 Flying Petals is probably really busy keeping up with all the orders and organizing all the photobooks. Just wait a few days, and if she has not responded by then, send a new email. Hope everything works out! She/he never replied back to me either. Was money already withdrawn from your account? I didn’t check to see if mine was. Maybe they will update us later after the payment period ends. I just hope there’s no problem/delay like the “tangparadise” order. Please give us update. It’s early April now. Has flying_petals sent anyone emails lately about their order being checked? or is there anyway to find out? I know what you mean. This isn’t my first time ordering like this and I always get nervous from the non-communication. I know it’s international but we should get frequent updates as it’s a lot of money. Anyway, I saw on flying petals website that orders were shipped April 19th and I think it said 1st orders should arrive around May 2? It’s in korean so translation might be off. supposedly they get shipped out tomorrow? I saw flying petals tweet a nice photo of the photobook and extras. can’t wait!! By the way, the pages aren’t 270 as specified – there are actually only 214 pages ): But still an amazing book! oh really? you counted? I didn’t pay attention to see if there was page numbers. I thought the photos would be better quality considering this is a “photobook” and not screen captured book. But I see no difference. Overall, I’m satisfied. What if I miss it? I really want it. Any ways that could help me out? Pls kindly help me. Thank you. I miss the payment period. Any other ways to get it? Pls help. Thanksss! Is this photobook still available? For SG buyers,many blogshops has it.Price ranging from the cost price, $53, to the higher price which is $75. does anyone know why my local webstore doesn’t include the DVD at their selling? It’s been almost a year since it was released so there might be a possibility that some of the special gifts just aren’t available with some sellers anymore. The DVD is only 10mins of fancams.